The ABS variant continues to draw 15.12 PS of maximum power at 8,500 rpm and 13.03 Nm of peak torque at 6,500 rpm from its 159.7 cc, single-cylinder, 4-stroke, air-cooled, 2-valve engine. The power is sent to the rear wheel via a five-speed gearbox. Stopping power comes from a 270 mm petal disc brake at the front with ABS while at the rear is a 130 mm drum unit. Buyers can also opt for a rear disc version that comes with a 200 mm brake although the variant still features single-channel ABS. Telescopic forks with hydraulic dampers at the front perform shock absorption tasks while at the rear are monotube inverted gas-filled Shox (MIG) with spring aid. Styling cues continue to feature halogen headlight with LED DRL, LED tail light, semi-digital instrument console, 12-litre fuel tank with scoops for a muscular look, split pillion grab rail, and an engine cowl. However, the ABS-equipped motorcycle would get revised graphics. The updated instrument console witnesses the addition of the ABS indicator while the front fender gets the ABS sticker. 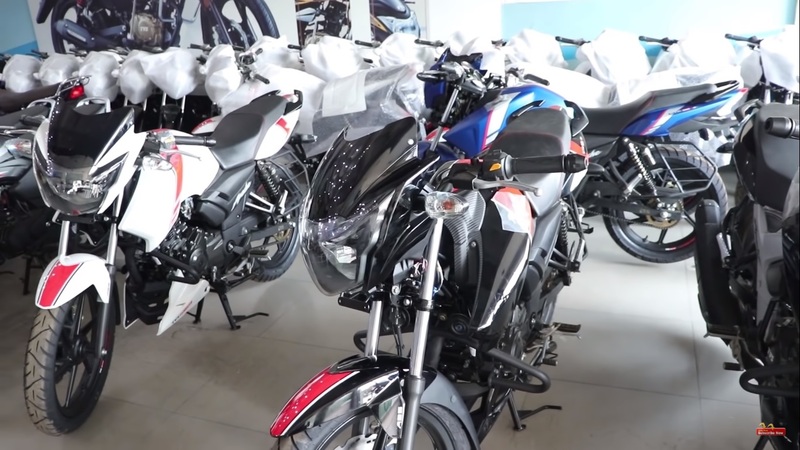 The motorcycles in the video were seen in Blue, White and Black colour options. With the RTR 160 ABS, the entire TVS Apache range is ready to comply with the upcoming safety norms. The motorcycle would compete against the likes of Suzuki Gixxer 155, Pulsar 150 Twin-Disc ABS, and the Honda CB Hornet 160R among others. TVS Apache RTR 160 ABS has started to arrive at the dealerships. The motorcycle was seen in three colour options at a showroom in North India. In more updates, TVS expanded its Start City Plus range with the addition of the Kargil Edition. TVS launched the Star City Plus Kargil edition in India at INR 54,399, a premium of INR 1,035 over the standard model that retails at INR 53,364 (prices mentioned for the Kargil edition are ex-showroom Delhi).